It was a Great Mail Day for me today! 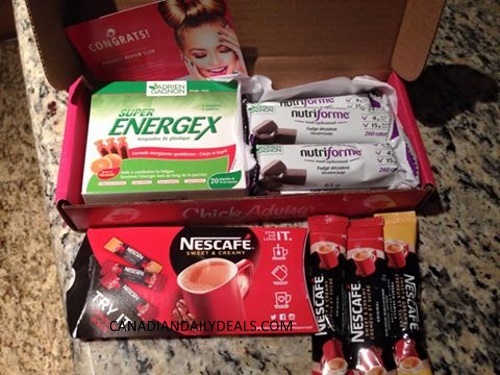 No Samplesource Sampler pack here yet, but I did get some goodies from Nescafe and Chickadvisor! Food samples are the best kind, am I right? The Chickadvisor box came in a pretty pink box with the Energy food items from their Adrien Gagnon campaign, this included 5 Fudge bars (which is delicious and a meal replacement) and Super Energex shots, which I haven't tried yet. Here is the original post about this campaign. The Nescafe items are their Sweet & Creamy Sampler Packs! I got three to try out in my coffee. Can't wait to give these a go in the morning. These look to be sold out at the moment, but they come and go so be sure to look out for our posts on social media for when/if they are back, here is the original Nescafe sampler pack post. What did you get in the mail today? Please share with us on our Facebook Page.